Need to hire out a fence post hole Borer with Operator? Fencing Solutions provide a range of fencing contractor services throughout the Kidderminster and Stourbridge area and will be happy to provide you with a quote for manned rental of our precision auger. You can hire our Post Hole Borer by the hour or day. Below: Our Post Hole Borer also comes with a Rammer attachment not featured in this video. Our Post Hole Borer or Mini Auger is available throughout the Midlands for pre Fencing Solutions excavation. Whilst the Post hole borer best suited to ground preparation under challenging circumstances, it will also make very quick work of any fencing installation where access is not an issue. The post hole borer hire service is a fast and cost effective solution to installing large fencing projects. 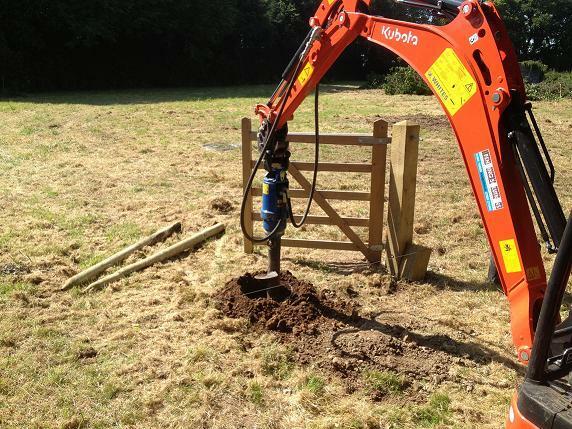 Where excavation is not necessarily a requirement, however, then you may want to hire out our Fence Post Rammer which is also competitively priced and available throughout the Midlands and adjoining Cotswold regions. Both Rammer and Borer rental services are ideal for farm / perimeter fencing projects. Our fencing contractors are all highly skilled Borer Operators and are always on hand to advise you on the best delivery of your fencing solution. To enquire about hiring out our Post Hole Borer simply fill out the quick form (left), or pick up the phone and give us a call now on: 01905 748856 or 07808 273405. We will be only too pleased to answer your questions and provide you with further information.